Bird enthusiasts nationwide will participate in A Swift Night Out, in an effort to help preserve the population of U.S. Chimney Swifts, a threatened bird species that – you guessed it – makes its summer homes in the country’s chimneys each year. The chief goal of the event is to count the number of Swifts that may be living on your property to give conservationists and researchers a better sense of whether the population is on the increase or is decreasing year to year. But it’s also an important reminder to homeowners to have their chimneys checked for guests, be them birds or other wildlife, before using the fireplace for the first time each season. It ensures the safety of your home and the animals that may have taken up residence there. We understand that Chimney Swifts, because of their status as a Federally-protected species, can’t be forcibly removed from chimneys. But the birds, which grow to be about 6 inches long, will migrate to their winter homes in South America by October. 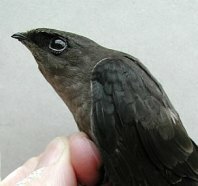 Swifts will reward you for your patience, should you find them in your chimney, by eating up to a third of their own weight in insects such as mosquitos, biting flies and termites. It’s like free bug repellent! Now is the time for your annual chimney inspection. If you think you have chimney swifts taking up residence in your chimney, mention them when you contact a CSIA Certified Chimney Sweep like 1st Choice Chimney for your annual inspection.